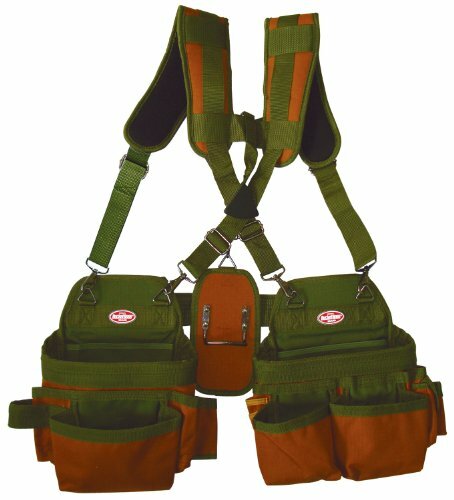 The Bucket Boss 55039 Builder's Rig Air-Lift combines suspenders and a tool belt to maximize tool-carrying capacity while evenly distributing weight across your body. Lots of pockets are included for holding smaller tools, and the side-handing bags keep tools away from your belly. The wide suspenders with two layers of breathable foam remove strain from your shoulders, while open end pouches hold your cat's paw, long screwdrivers, and combination square. You can reverse the pouches to fit left and right-handed users. The air-lift fits up to a 48-inch waist, and it weighs just 2.3 pounds.